Some of the most famous pirates in history traversed the seas of the crystalline Caribbean. They sailed along the lush hillsides of the British Virgin Islands (BVI), beckoned by protected coves and inlets. The stories of pirate lore inspired me to visit an 8½ mile tiny British island called Virgin Gorda. The island’s massive, giant boulders, called The Baths, are as dramatic to this island today as the pirates were to the past. The Baths are located at the bottom of a hill on the southern end of the island. 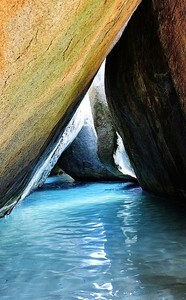 The boulders form a network of caves and rest on powder white coral sand along the water’s edge. Wading in and out of sandy-bottomed tide pools and the Bath’s Cathedral Room – mysterious water filled grottos – my adventure took me through a maze of tunnels and arches. The sun streamed between the crevices, the only source of light, and the shadows cast left an ethereal feeling. Driftwood ladders signaled a climb upwards through the interior of the cave. Ropes assisted with navigating over and between the immense boulder formations. These boulders, volcanic in nature, create an environment unique and memorable, it was like no other I’ve ever experienced. Opening up onto Devil's Bay, a stunning powdery sand beach with shimmering clear blue water, the Baths towering boulders created a perfect backdrop for sunbathing and snorkeling. At the end of the day, I hiked back up the boulder-studded mountain to a restaurant appropriately known as Top of the Baths for a refreshing rum punch. Lacking the bustle and development, Virgin Gorda is a place where you make your own adventures, and it is here they take their pirate lore seriously. The stories flowed as easily as the rum, and as tales unfolded, I learned how Blackbeard allegedly abandoned 15 of his men on a nearby uninhabited island off of Deadman’s Bay, with only a bottle of rum for sustenance. The climate of the British Virgin Islands is tropical and influenced by the trade winds. Off the beaten path, only small planes and helicopters can land on the airport runway. Puddle jumpers fly From St. Thomas, Tortola, and San Juan Puerto Rico. I arrived by ferry. They run regularly from the island of Tortola. When visiting, bring your sense of adventure and an appreciation for the island’s unspoiled beauty. As I daydreamed about Robert Lewis Stevenson’s novel, Treasure Island, I thought perhaps I’d be the one to uncover a doubloon somewhere along the way.